Two men ​standing​ trial charged with manslaughter and GBH said they were acting in self-defence, a court was told. The pair both deny charges of manslaughter and GBH (grievous bodily harm). 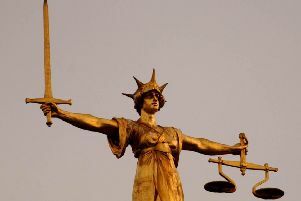 Both defendants gave their evidence at their trial at Lewes Crown Court on Friday (November 17). Earlier in the trial, the court heard Andrew Hill was severely wounded in the attack, suffering broken ribs, a punctured lung and a missing tooth. His older brother Brian, 60, suffered a fatal head injury after being knocked down, prosecutor Simon Taylor told the hearing. The court was shown CCTV footage from a taxi which caught the attack. In the footage Bourdon-Pierre and Smith are seen asking about the cost of the taxi fare shortly before the Hill brothers passed by. As the brothers passed the taxi, the prosecution says Smith can be heard on the footage calling after them, shouting ‘squint eye’ at one of the brothers. Bourdon-Pierre said at Friday’s hearing: “I was not expecting trouble at the taxi ran​k​, absolutely not. “It all happened really quickly. The next day I was not able to remember anything clearly. “When we left the club I headed towards the cashpoint to get some money out for the week. “The taxi driver asked for £7 and I tried to negotiate the fare. I had a pocket full of change and was getting the money out and can then remember Matthew saying, ‘Do not come close to me, mate’. I did not know what it was all about at the time. That’s when I realised something was wrong. “He (Andrew Hill) looked aggressive to me. When I said we were getting in the cab I was trying to get the message across to the driver and the bloke. I was not trying to start a fight. “Andrew came back towards the taxi in a boxing stance. “I thought I was going to get hit. I reacted. At the time it all happened so quickly. “I threw a punch at Andrew. I did not say that in interview because at the time everything happened so quickly. “I used my left hand, not sure whether it connected or not. I swung with my right hand and by the time this happened, Andrew had been taken out by Matthew. “At the time he was right in front of both of us and I thought I was going to get hit. Bourdon-Pierre said he ‘accepted’ that he had ‘landed a punch’ on Brian Hill on his left cheek. He said: “Brian just fell down. I felt the need to strike Brian because they were in it together (Brian and Andrew). It happened so fast. I just did what I thought was necessary at the time. “I was devastated when I was told that Brian had died. I could not believe a man had died because of me. In giving his evidence, Smith said: “I punched Andrew because I thought I was going to be hurt myself. “I started the exchange and lied about it in interview because I was scared. “I said ‘squinty eye’ to Andrew and he became aggressive and took offence to what I said. He moved towards me and his brother was following to the side towards us. I felt intimidated. “They started to walk away and I did not follow them because I did not want a fight. “I saw Andrew go into a boxing stance. I threw a punch to hit him on the left hand side of the face because I felt even more intimidated. He had not punched me. “He fell to the ground and I just walked away from the situation. I did not stamp on Andrew at all nor kick him in the rib area while he was on the ground. Smith told the court he laughed while he was in the taxi after the attack because he ‘had been drinking’. He added: “There was almost the sense of relief that these two men had come and attacked us and we had defended ourselves. I was not spoiling for a fight. I did not know the extent of the situation and did not think that the injuries were bad. “I accept that I started the verbal interaction with Andrew Hill. I did lie about certain parts of the evening because I was scared once I found out the extent of their injuries. “I do not know why I said ‘squinty eye’. I was acting like a stupid boy to be honest. It was a stupid comment I had made after having a few beers. The jury is expected to deliver its verdict today (Monday, November 20).